Fruit or a Salad –or what? Have you ever spent your precious time and money trying to buy just the right papaya or paw paw? I have and still do. I always turn them around to check if it will be the right one, try to weigh them in my palm to see if its heavy or light, whether it will ripen well or not etc etc. Some say if the papaya is heavy then its good, if it is oval shape then it will be sweet. You can buy any shape and its all like a pot luck. Some are extremely sweet and some can be unbearably spongy and bland. Now if you folks living in UK have spent pounds buying the precious tropical fruit and it turns out really bland you either have the option of eating it just the way it is or turning it into a delectable dish…. a salad. Yes, a salad, not the raw papaya thai style salad but a ripe papaya salad. Mix the vegetables and fruits in a bowl. 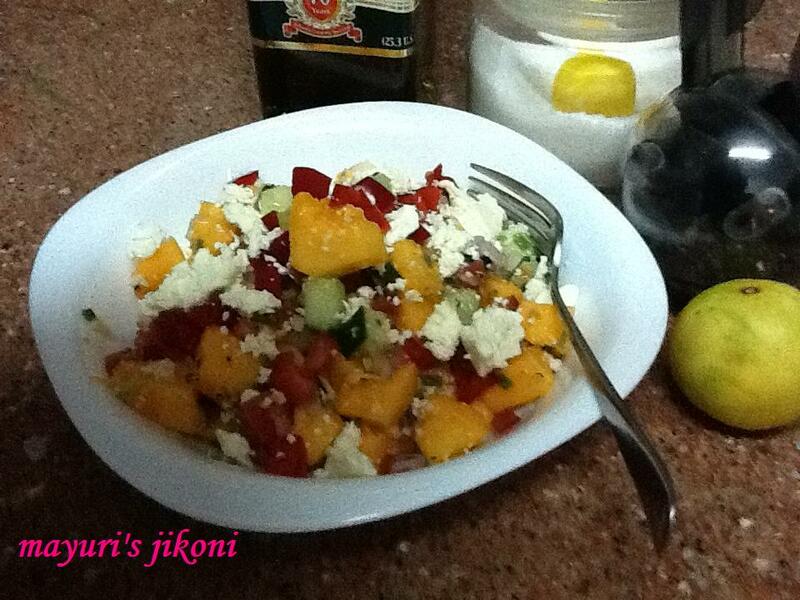 To prepare the dressing, whisk the oil, lemon juice,honey, salt and pepper together. Add the crumbled feta on top of the salad. Pour the dressing over it and serve. Don’t use over ripe papaya. It will make the salad mushy. Freeze it and make a smoothie. If the cucumber skin is tender, don’t peel it. If you prefer add a finely chopped green chilli.